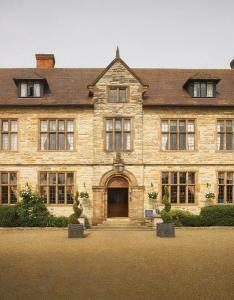 Choose from 105 hotels and guest houses in Warwickshire. Shown below a just a selection of the hotels available. To search within an area please use the menu on the right. In the heart of Stratford-upon-Avon, this 17th-century inn has been a meeting place of writers, actors and artists since the 18th century. The Shakespeare retains much of its original architectural character, but has also benefited over the years from sympathetic and careful modernisation. Behind the distinctive front, the hotel has 74 en suite rooms, including 3 four-poster rooms and 7 suites. Antique furnishings and period decor create a mood of relaxed elegance, while personal service and facilities combine to ensure you'll have everything you need The hotel is full of character, with oak beams, creaky floorboards and open fires. All of the rooms are named after the plays and characters of William Shakespeare. Every day between 14:30 and 17:30, a choice of freshly brewed teas, delicious sandwiches, tempting pastries and scones (with jam and cream) are served in the delightful surroundings of the lounge and Quill bar. A traditional country inn with rooms. Just three miles from Stratford centre. A beautiful inn offering good food, fine wine and real ales with traditional accommodation in a stunning location. Formerly a splendid private house, the Mary Arden Inn dates back to the 1700s. You may recognise the name Mary Arden as William Shakespeare's mother. Standing opposite Mary Arden's house, the inn offers the perfect country retreat for visiting Stratford upon Avon, the birthplace of Shakespeare, and all of the local heritage and history. The Mary Arden Inn has 11 en-suite bedrooms, all decorated and furnished in a traditional style to compliment the beautiful building. The traditional bar with an open fireplace and original beams offers an extensive bar menu, along with a selection of real ales and plenty of character. The bar leads on to a charming terrace and beer garden, which is the ideal setting for a relaxing summer. The Mary Arden restaurant also offers an excellent a la cart? menu, complemented by an imaginative wine list and relaxed ambience. Set within a grade II listed building, in a haven of peace and tranquillity, this recently refurbished bed and breakfast is ideally situated within a few minutes of Shakespeare Country and the Cotswolds. The courtyard garden, with its splendid water feature, is the central focus of Coughton Lodge. Here you can plan the day's activities after breakfast or relax in the evening sunshine, reflecting on the day's events. Surrounded by open countryside, yet convenient for all major attractions, including the N.E.C., the lodge's facilities are guaranteed to provide everything you may need to ensure a pleasant and comfortable stay. 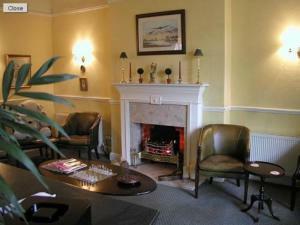 The Golden Lion Hotel is privately owned and proudly delivers an individual service. Located in Shakespeare's county. At the Golden Lion Hotel, you can be assured of quality, having won awards for food and excellence in service. The Golden Lion Hotel meets your every need; business, pleasure and celebrations. All bedrooms are en-suite and individually designed, including a mahogany Four Poster bed and a unique Chinese Four Poster bed. Set in one of Warwickshire's most picturesque and best kept rural villages, the Golden Lion Hotel is the ideal location for visiting Rugby School, Stratford-upon-Avon, Warwick Castle, Althorp Stately Home and the NEC. Coventry Airport and Birmingham International Airport are nearby, therefore travelling is kept to a minimum. The Bar and Restaurant are in the original building, creating a warm and welcoming atmosphere. The restaurant recently won an award, and continues to provide outstanding dishes. With a brand new function suite, the Golden Lion Hotel can accommodate conferences, weddings, private occasions and celebrations. Situated in the historic centre of Stratford-upon-Avon, this family-run guest house is ideally positioned within easy walking distance of many of the town's attractions, including the new RSC Theatre. Offering a high standard of clean and spacious accommodation, with friendly and efficient service in a relaxed atmosphere, the Applegarth is the prefect choice for both business and leisure travellers. During your stay at The Applegarth, you can easily explore the centre of Stratford-upon-Avon, which is steeped in culture and history. Just a short stroll away you will find the Swan Theatre and, even closer, the beautiful Bancroft Gardens. 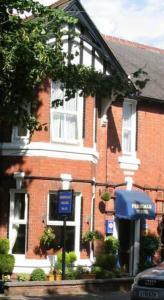 Eaton Court Hotel is situated in a calm backwater of Leamington Spa & benefits from excellent parking & private gardens. We offer spacious en-suite rooms, an excellent restaurant and a well stocked bar. We are a short walk from Leamington's town centre, also ideally located for visiting Historic Warwick and Shakespeare's Stratford on Avon. Within easy reach of Birmingham's NEC and International Airport, Stoneleigh's NAC, Warwick University and the Midland's Motorway network. Nestled in a woodland location, only a few minutes away from Kenilworth, Warwick, Coventry and the NAC. Woodside is the perfect setting for your event. The range of air-conditioned conference and training suites, well equipped bedrooms and extensive leisure facilities, lend themselves to a variety of events. With over 35 acres of land Woodside is the ideal venue for outdoor activities or teambuilding exercises. The conservatory can be utilised for private dining, or drinks receptions whilst our own private 'pub' the Parsons Folly offers a chance to unwind and relax. Our team of chefs at Woodside have a keen eye for what our guests want by preparing an exciting menu that always includes a healthy eating and vegetarian option. The Victoria Park Hotel is situated in the historic Georgian town of Leamington Spa. Its great location makes this an ideal place to stay for either business or pleasure, situated very near to Warwick (5 minutes), Stratford Upon Avon (15 minutes), Kenilworth (10 minutes) and Birmingham (25 minutes). The hotel offers 20 spacious and well-appointed bedrooms, all with en suite facilities, broadband internet access and pay movie channels. The hotel prides itself on cleanliness and comfort, offering a home away from home, in an excellent location. Just a few minutes walk from the town centre, Warwick Castle only a 5 minute drive and Stratford Upon Avon, the home of Shakespeare, a mere 15 minutes away, makes the hotel an ideal base in the heart of England. Besides offering excellent accommodation, you will also find 2 lounges, one non-smoking, a well stocked friendly bar, computer/ printer/ internet hire and games console hire. There is ample secure car parking at the front and rear of the hotel. This country-house hotel with leisure club is a short drive from Stratford-upon-Avon and 1 mile from junction 15 of the M40. Glebe Leisure Club has a relaxing massage spa pool and a 9-metre heated swimming pool with hydro swim jets. There is a Swedish-style sauna, steam room and an air-conditioned gym. Beauty treatments are available at an additional cost. 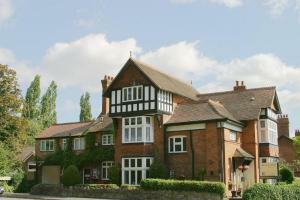 Glebe Hotel has luxurious bedrooms with LCD flat-screen TVs and feature beds. 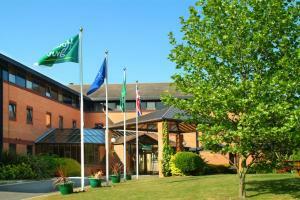 There are conference and leisure facilities for up to 110 people. The hotel was built in the 1820s as a rectory to the Church of St. Peter, which stands adjacent to the hotel's grounds. 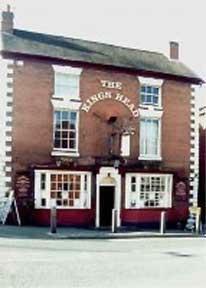 It is a short distance from Warwick, Kenilworth, Leamington and the Cotswolds. Built in 1827, The Adams is a special place to stay. Whether on business or leisure, you will experience our high quality service and a refreshing and friendly atmosphere. We offer tastefully decorated rooms, all en suite with a bath or shower, TV and direct dial telephone. There is ample car parking within the grounds. Free internet access is offered, and there is also a resident's bar. The Adams is completely non-smoking throughout. 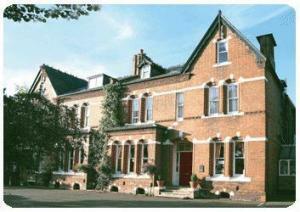 Aidan House is a charming Victorian town house with free Wi-Fi and a fine position in Stratford-upon-Avon. The Shakespeare Theatre and other local attractions are a few minutes' walk away. The guest house was built in 1897 and many of its original features have been retained. Each comfortable room has a private toilet. A hearty Aidan House breakfast is a great start to the day. The train station and the River Avon are both within walking distance. Private off-street parking is available. Thomas James Hotel is situated in the old town, walking distance to the main town centre, Parks and 2min from the train station, Warwick Castle is 10min drive and Stratford-upon-Avon 20min away. Our Location makes us an ideal place to stay for either leisure or business. All rooms come with en-suite facilities, FREE broadband internet access, We also have 2 four poster bed, There is a popular bar on the ground floor with free bar hire for any occasion. 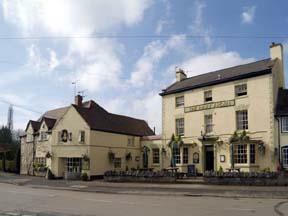 The New Inn, near Stratford upon Avon, is a family run and well-known starting point for several walks. The New Inn offers a log fire, separate non-smoking restaurant, beer garden, children's area and details for walkers. The New Inn is a family run business. We offer a bar menu and a comprehensive restaurant menu. Our food is of high quality and all freshly prepared. Breakfast is included in all of the rates. The New Inn is situated on the edge of the picturesque village of Clifford Chambers (with its beautiful waterfall), approximately 2 miles from Stratford upon Avon. We are in close proximity to Warwick Castle, The Cotswolds, and the nec. All rooms are decorated for luxury and have en-suite bathrooms. This historic Georgian hotel is in the centre of Stratford-upon-Avon, just 3 minutes' walk from the high street and main attractions. An important Grade II Listed building, The Best Western Grosvenor prides itself on its friendly and efficient service, in a relaxed atmosphere. The ground floor has lots of character, with small, cosy lounges that match the area's Shakespearean past. Shakespeare's Birthplace, the Royal Shakespeare Company theatres, and the gardens by the River Avon are all close by. Ragley Hall, Warwick Castle and Royal Leamington Spa are just a few miles from the Grosvenor Hotel. This Best Western hotel is easy to reach by road and Birmingham's NEC and Arena are only a 30-minute drive. Conveniently located close to the town centre and a short walk away from the rail and bus stations, this tastefully converted detached Victorian villa is situated on a tree-lined avenue. Originally built in 1846 and established as a hotel in 1977 by the Chandler family, this welcoming residence provides comfortable accommodation in a convenient and easily accessible location. Situated less than 3 miles from the M40, Buckland Lodge provides an ideal base from which to explore the Midlands, with Warwick, Kenilworth and the city of Coventry all a short drive away. Leamington Spa itself has much to offer, and its parks, gardens and town centre are all within walking distance from the guest house. All of the rooms at the guest house are en suite and are equipped with standard facilities. Each morning the guest house provides a full English breakfast, while evening meals are available on request. The family-run Old House is on the edge of the charming village of Witherley. It offers comfortable accommodation, free Wi-Fi, freshly cooked breakfasts and a very warm welcome. 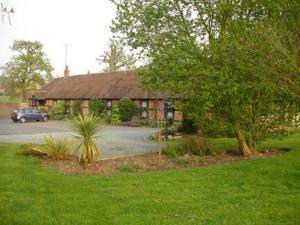 Rooms are en suite and have Freeview TV, and at the rear of the house there is private parking. The Old House B&B is 10 minutes from junction 10 of the M42 and junction 1 of the M69. It is just south of Atherstone on the A5. Good eating houses are a short walk away. Set in heart of the old town of Kenilworth, directly opposite the castle, this lovely, substantial Victorian house now offers attractive, traditional 4-star guest accommodation, alongside a warm, friendly welcome. Built around 1890, the hotel's historic original structure now houses comfortable, traditional accommodation. Nestled between the beautiful Abbey Fields and Kenilworth Castle, the guest house has 12 well-appointed en suite rooms and offers special Sunday rates. Just a short walk away from Stratford town centre and the RSC Theatre, this delightful family-run B&B has been completely refurbished and now boasts 4 stars from Visit Britain. Avonpark House is also ideally placed to explore the surrounding area which is home to areas natural beauty, including the picturesque Cotswolds and a host of historic attractions, including Warwick Castle. Stratford itself is home to the birthplace of William Shakespeare and numerous pubs and restaurants. You can also enjoy boat trips along the river and shows at the RSC Theatre. In the evenings you can relax in the comfort of your newly refurbished guestroom and keep in contact with friends, family and colleagues using the free Wi-Fi access on your own laptop (depending on signal strength). Close to historic Warwick Castle and minutes from Royal Leamington Spa, this Holiday Inn hotel is in an ideal location for accessing town and the motorway. The hotel surrounds you with all of the conveniences that make business and pleasure travel easy. There are 91 spacious rooms, a full dining restaurant, fitness room, lounge bar and great service. Rooms are furnished to a very high standard and appointed with full facilities including high-speed internet access. Holiday Inn Leamington Spa is ideally placed for accessing many places of interest in the surrounding area such as Warwick Racecourse (2 miles) and Stratford-Upon-Avon (12 miles). At the end of the day you can return to the bright, informal restaurant, styled around a conservatory theme, and choose from a wide range of international dishes. Over 100 years old, this charming building has unique character in leafy Hillmorton village. There is free Wi-Fi, free parking and easy access to the M1 (1 mile/1.6 km). The Hillmorton Manor Hotel is in a good location for visiting Rugby School, Stratford-upon-Avon, Warwick Castle and Althorp Stately Home. 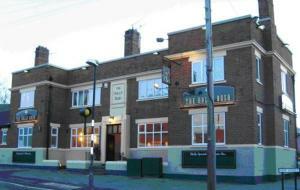 Hillmorton Manor is also within easy reach of the DIRFT Industrial Estate. With free wireless internet and free parking, this elegant residence is comfortably furnished. Enjoy high hospitality standards and a friendly atmosphere. Close to the centre of Kenilworth, there are many restaurants for you to enjoy. Set in the historic market town of Rugby in Warwickshire, this family-run public house provides a traditional pub atmosphere with good food and a selection of comfortable rooms. 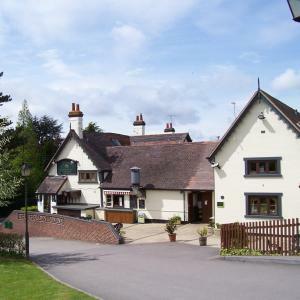 The Holly Bush Inn is within easy reach of Coventry and provides an ideal base for exploring this region. The River Avon runs through Rugby, offering you the chance to enjoy boat trips to nearby towns, such as Stratford. Situated 5 minutes from Stratford town centre and the new Courtyard Theatre, this hotel combines a strong sense of history with the modern facilities expected from a leading Macdonald Hotel. It is rumoured that William Shakespeare presented his first performance of 'A Midsummer Night's Dream' on the lawn under the cedar tree in the hotel gardens. The hotel has 113 bedrooms with private facilities, the majority of which are located in the modern wing, and offer air conditioning, 24-hour room service and many other facilities. Manor Grill restaurant, with an AA Rosette, provides simple dishes using fresh market ingredients, with a modern English influence. Light snacks are also available in the bar and lounge areas. During the summer months, the terrace offers al fresco dining. 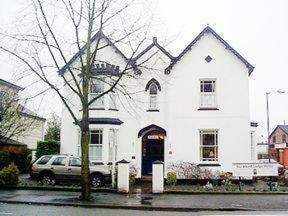 Arden Way is a family run Guest House, offering a hearty breakfast and being just a 5 minutes walk from the theatres. All but a single room (which has private facilities) are en-suite and we have ample car-parking for our guests. 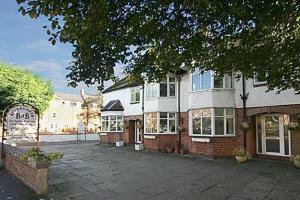 Arden Way Guest House has 6 letting rooms, all tastefully decorated. Arden Way was awarded a 2005 - 2006 AA Red Diamond Award in recognition of being among one of the best 10% of AA rated 3 diamond establishments, due to the quality of our bedrooms, bathrooms and public areas. We are conveniently situated for the Cotswolds, Warwick Castle and the NEC. Our aim is not only to welcome guests to our home as well as our town and hopefully they will return to their homes with long and happy memories. Surrounded by gorgeous countryside, this charming inn has a smart dining room, a cosy bar and just 4 individually decorated, luxurious en suite rooms. Within an hour's drive of London, the beautiful location and stunning surroundings make this inn a great choice for a relaxing or romantic break. Curl up in front of a DVD, take a relaxing stroll through the peaceful countryside or take a trip into nearby Stratford-upon-Avon or Warwick. With a team of experienced staff, a roaring fire in the bar and a log burner in the candlelit restaurant, the inn has a lovely, informal, relaxed atmosphere, which allows you to feel quite at home from the moment you arrive. A fine Elizabethan house set in 11 acres of grounds in the heart of Shakespeare's county, Barcel? 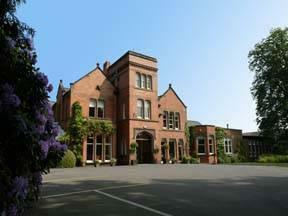 Billelsey Manor Hotel can be found minutes from the M40, just outside Stratford-upon-Avon. Immerse yourself in the life and literature of William Shakespeare, and plunge yourself into the land of historic England. A beautiful country retreat with modern rooms and a fine-dining restaurant, Barcel? Billlesley Manor Hotel captivates the very essence of central England. The hotel has 69 rooms and 3 four-poster rooms. Half of the bedrooms are in the main house and the other half are in the beautifully refurbished cedar barns. This privately owned and run stylish Georgian town house benefits from an AA rosette ? la carte restaurant serving modern European food. Located just off the A5 between Nuneaton and Tamworth, Chapel House Hotel is within a 25-minute drive of the NEC, M1, M42 and M6. This charming property has been tastefully converted into a special kind of small hotel. Dating in part from the early 1700s with later additions, many original features have been retained and others carefully restored. 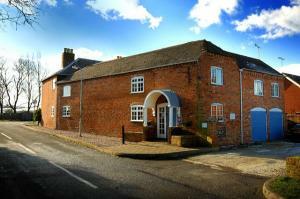 The comfortably appointed and individually furnished bedrooms all have en suite facilities and are located on 2 floors. Guests may also take advantage of our elegant restaurant, awarded an AA Rosette for high quality food and complemented by a comprehensive wine cellar. Dating back to the 16th century, the 4-star Legacy Falcon Hotel is a classic Tudor building that has had a fantastic ?2.5 million refurbishment. 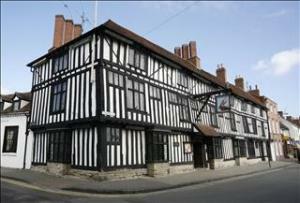 The Legacy Falcon Hotel is a charming Tudor residence, with half-timbering and narrow, slanted windows. The inside has rich colours, exposed wood panelling and wrought-iron fittings that create a cosy environment. Accommodation is in newly refurbished rooms in the slightly more modern section of the Falcon Hotel, situated at the rear. There are 20 rooms based in the mid-section part of the original building. 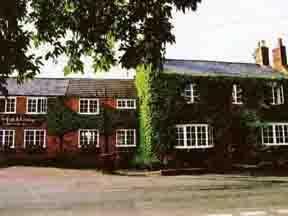 The Legacy Falcon Hotel is 6 miles (9.6 km) from the M40 and has its own car park for 120 cars.